UK and EU negotiators must ensure Brexit discussions move on to discuss trade by December, Welsh Finance Secretary Mark Drakeford has said. He said accelerating the talks was "so important" for Welsh businesses who are currently making investment decisions. Mr Drakeford was speaking after meeting European Parliament Chief Brexit negotiator Guy Verhofstadt in Brussels. The minister said there was an "extra obligation" on the UK to move the talks along as it had chosen to leave the EU. "We say to the UK government that it would be catastrophic to leave the European Union without a deal," Mr Drakeford said. "You need to be focused, absolutely relentlessly and forensically focused, on getting a deal that works for Wales and works for the United Kingdom." In the initial phase of the Brexit negotiations citizens rights, financial commitments and the Irish border are being discussed. 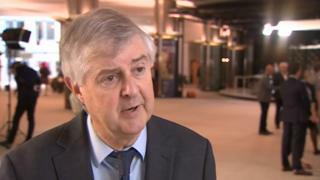 Mr Drakeford said Welsh ministers were concerned that it had not been possible to reach a final agreement on citizens rights - "supposed to be one of the more straight-forward issues". Until sufficient progress has been made on the first phase of the discussions, the EU negotiators have said they will not move on to discuss the future trading relationship with the UK. After a dinner in Brussels on Monday night, Theresa May and EU Commission President Jean-Claude Juncker issued a statement saying the negotiations "should accelerate over the months to come". Because Welsh businesses "are having to make investment decisions now about their businesses", Mr Drakeford said "accelerating the negotiations" and "focusing on a good deal, and the good deal that is necessary for Wales is so important for those businesses". He added that since it is the UK that is leaving the EU and not the other way around, there was an "extra obligation on the UK government" to make concessions. Also meeting Guy Verhofstadt in Brussels on Tuesday morning was the Scottish Brexit Secretary Mike Russell. He echoed the Welsh Government's view that a no-deal Brexit would be "disastrous - it must not happen". The Welsh and Scottish governments have presented an united front in their opposition to the law proposed by the UK Government to transfer EU law on to the British statute book. Called a "power grab" by First Minister Carwyn Jones, Mr Russell said the EU Withdrawal Bill was "the biggest threat we've ever faced in the 20 years of devolution". Mr Russell praised the relationship between ministers in Cardiff and Edinburgh as "one of the few positive signs one might say out of the Brexit mess."